Nanomedicine Lab bakes for Pancreatic Cancer UK! Some Nanomedicine Lab members contributed in the bake sale fundraiser organised on the 4th March by our lovely colleague from the Division of Cardiovascular Sciences, Eliza Fotiou, for Pancreatic Cancer UK. We are so proud to be a tiny part of this huge effort! March debuted with Livia Crica presenting her latest research at the National Graphene Institute within the weekly Friday seminar. She focused on the in vivo interaction of graphene oxide sheets with biological fluids, her results raised both smiles and numerous questions amongst the graphene science audience, particularly Professor Geim! Congratulations to Dr Chris Bullock for his successful viva examination! Julia Tesch shines a spotlight on Nanomedicine Lab current research work on the potential of graphene materials for the growth of human and other mammalian cells. Read more here. On 11 February, the United Nations and its partners worldwide celebrated women and girls in the International Day of Women and Girls in Science. We celebrated Dhifaf who specializes in the latest imaging techniques to reveal the pharmacology of new nanomedicines; and Sinead who models Parkinson’s disease in rats! Congratulations to Dr Filipe Rodrigues for his successful viva examination! Michelle presents poster at the Royal Society of Chemistry Symposium: Functionalising Solid Surfaces at Burlington house, London. Sinead was recently interviewed by BBC North West Tonight speaking about the uses of graphene in healthcare at the opening of the Graphene Engineering and Innovation Centre (GEIC) opened by HRH Prince Andrew, whom she met showcasing the work of the Nanomedicine Lab in utilising graphene for medicine. Our delegation included also Dhifaf, Sandra and Cyrill. 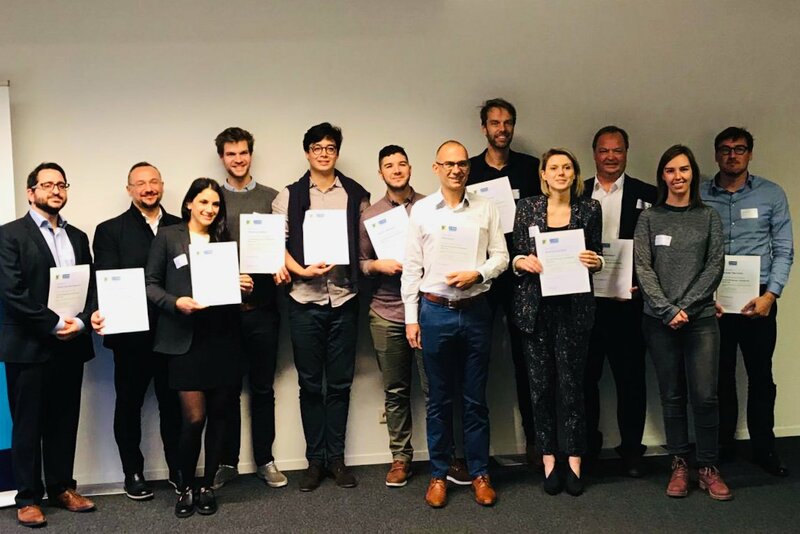 In this intensive bootcamp, two-week programme organised by Vlerick and Imperial College Business Schools, seven teams explored business model design methodologies, presentation and pitching skills in Belgium.